Taco Tuesday just got a whole lot more fun! 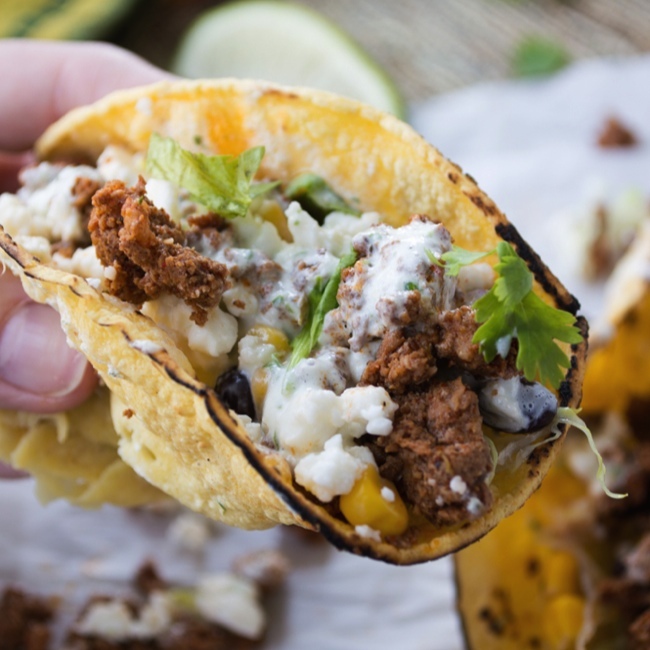 Chock full of chorizo, black bean and corn salsa, cilantro-lima crema, and queso fresco these chorizo tacos are a flavor explosion in your mouth! Ahhh tacos. Who doesn’t love a good taco? Tacos are kind of having a “thing” right now, which I’m totally on board with. 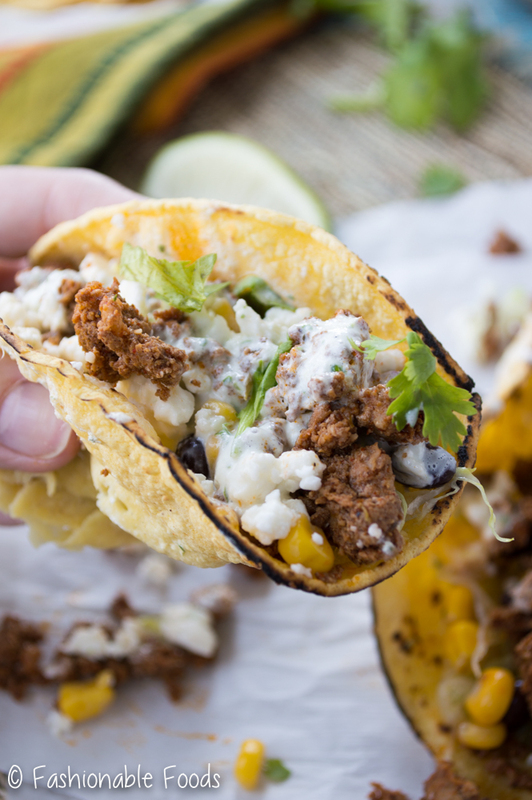 Today’s recipe has been a long time coming as it’s my favorite taco…ever. I can’t take credit for it, though. I’ve been enjoying these tacos at one of my favorite restaurants for quite a while now. For a while I was chowing down on them at least once (ok, more like twice) a week. Sadly I’m about an hour away from that restaurant now. Let’s talk about chorizo. I love chorizo, but it can be kind of hard to find good Mexican chorizo. At least around here. Solution? I made my own. Now, you definitely don’t have to make your own chorizo. If you can find the good stuff, by all means buy it. Just remember you want the Mexican (not Spanish) variety. Mexican chorizo is a fresh sausage that has to be cooked before use and Spanish chorizo is a dried and cured sausage. I do highly recommend making your own as it’s really quite easy. Plus, you know exactly what’s going into it and you can stock up your freezer! That means chorizo tacos are always in reach. ? I used this recipe and wouldn’t change a thing about it – it’s perfect! I’ve made it twice already, the first time just a single batch to try it. We finished it off within a week. ? So, over the weekend we made a double batch and filled up the freezer! 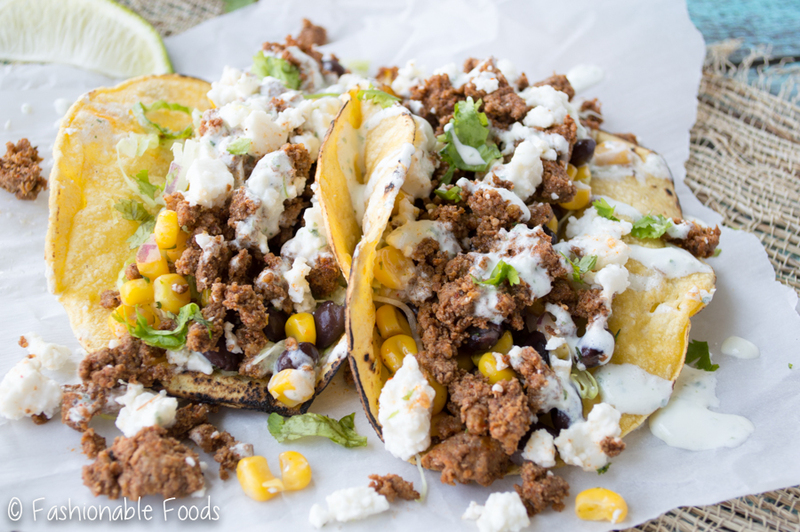 All of the components for these chorizo tacos are very simple to put together. The black bean and corn salsa is a mix of canned black beans, sweet corn (fresh or frozen works), red onion, lime juice, honey, and cilantro. The cilantro-lime crema is my own little addition to these tacos – the original have a tomato-avocado crema, but my avocado was bad. I ended up improvising and went with a simple lime and cilantro concoction. So tasty! 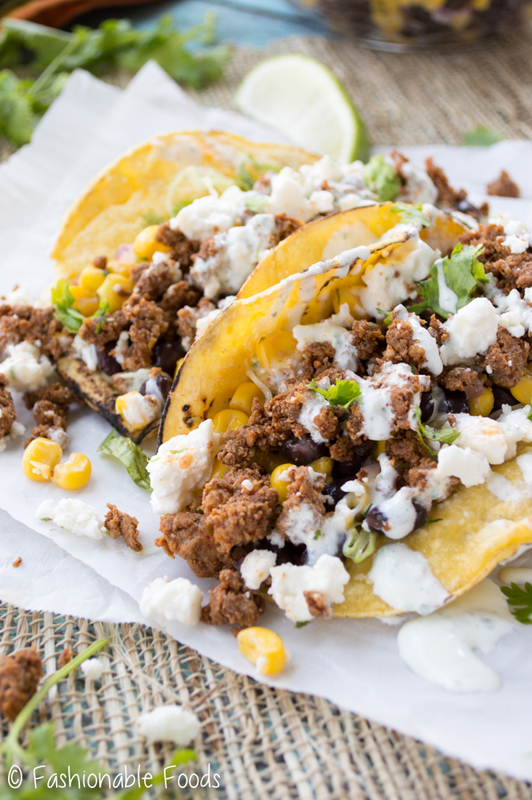 Shredded lettuce and queso fresco are also must-have additions. I have been obsessed with queso fresco lately. If you’ve never had it, it’s a mild-flavored crumbly cheese that is just perfect for topping all sorts of Mexican dishes. Especially these tacos! By the way, how was your weekend? I was so excited about chorizo tacos that I forgot to ask! I had a fantastic weekend and am pretty sad it’s over, but next weekend will be just as fun. Why you ask? My amazing bridesmaids and friends are coming to visit me and have a little bachelorette shindig! In case you were wondering, these tacos are going make an appearance. I’m doing a taco bar! How awesome does that sound? We are also going to a paint/wine studio, so it’s going to be a fun-filled weekend! If you love tacos you NEED to try these. 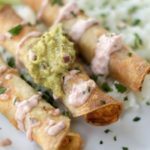 Even if you don’t love tacos you should try these. If you don’t love tacos we really can’t be friends, so why are you even here? Just kidding!! This is a no judgement zone. But seriously, I think these chorizo tacos would be really hard not to love. Enough of my rambling. Enjoy your week and go eat some tacos! ? Combine all the ingredients in a bowl and toss well. Cover and refrigerate if not using within an hour. Otherwise, allow the salsa to sit at room temperature while you prepare the rest of the tacos. Whisk together the sour cream, cilantro, and lime juice until smooth. Season with salt and pepper and add a little water to thin the consistency so that it can easily be drizzled. Warm the corn tortillas one by one in a hot pan or over an open flame on a gas stove. 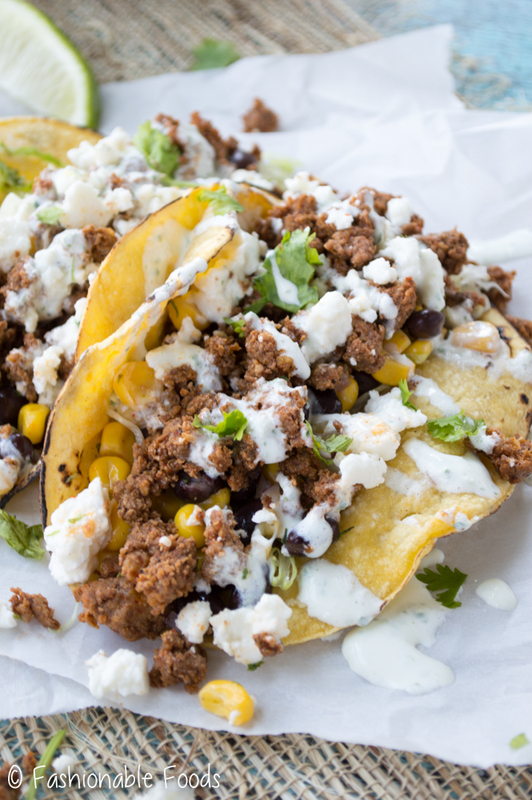 Build your taco – start with shredded lettuce, then top with the black bean and corn salsa, chorizo, queso fresco, and then drizzle with the crema. Enjoy! Ok now I’m craving tacos for breakfast! But that’s not a bad thing, right? These look amazing, Keri! I just recently started adding chorizo into about everything, as I love it. These tacos have my name written all over them. So perfect for Taco Tuesday! Not a bad thing at all, Gayle! Thank you for the kinds words 🙂 I’m obsessed with chorizo lately and am adding to anything and everything! I love me some tacos! 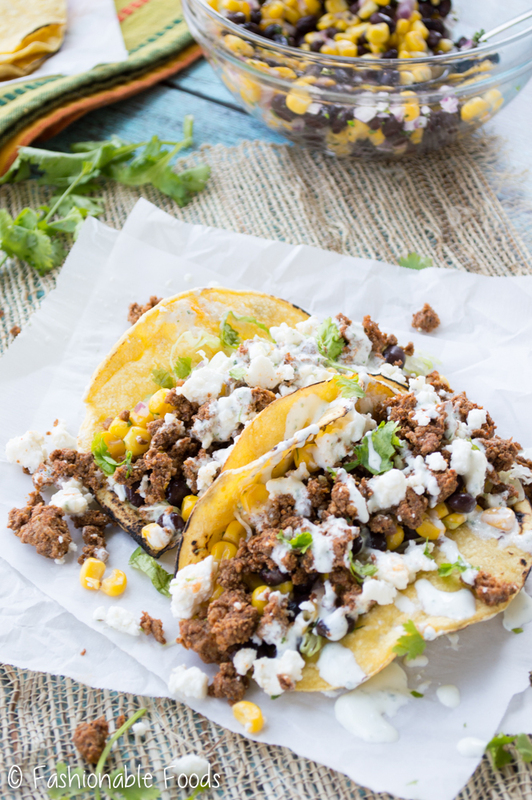 Tacos with chorizo sounds so incredible! These need to happen for dinner!! I’ve never had a chorizo taco before! What a fantastic idea! I love all the flavors in here. Have fun with your bridesmaids shindig! Holy moly, taco heaven, Keri!! I can see why these are your favorite! Thank you so much for re-creating these at home, dear! 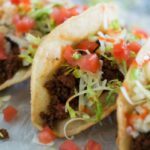 These look absolutely perfect and I can already tell these tacos are going to happen in my house on repeat! Total drool fest happening over here. Pinned! Cheers, girlie! This is making me drool, Keri ?. 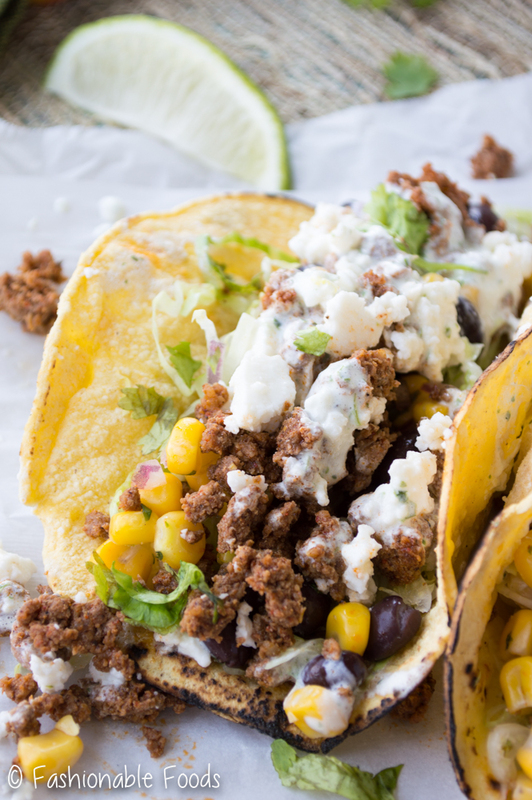 Chorizo has THE MOST AMAZING flavor ever – such a good idea to use them in tacos! Pinned :). Thanks Annie! Chorizo really is the best! Hi Bo! The recipe that I use is linked in the post. CHORIZO TACOS!? Yes. Yes. Yes. Not sure if I’m more excited for the tacos or more excited for the cilantro-lime crema. Loving this! Thanks Melissa! 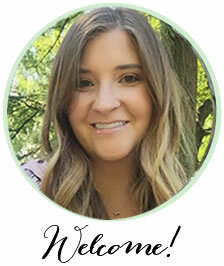 I could never choose my favorite part – I love it all! Made these for dinner tonight. INCREDIBLE! Oh Snap, now I want Mexican in the worst way!!! These have me drooling all over myself. Thanks for sharing at Celebrate with 8. 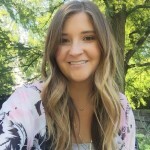 Thank you so much for sharing, Kristin! I’m so glad you and your family enjoy them. The cumin sounds like a perfect addition and the cotija cheese is also delicious! I alternate between that and the quest fresco because I love both 🙂 I truly appreciate your kind words! Just made the chorizo tacos with the salsa and the cilantro lime crema. It was delicious. It was hot chorizo, great salsa and to cool it off the cilantro crema. 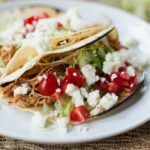 Great recipe and one we will keep on our Taco Tuesdays. Yay! I’m so glad you enjoyed, Linda ?